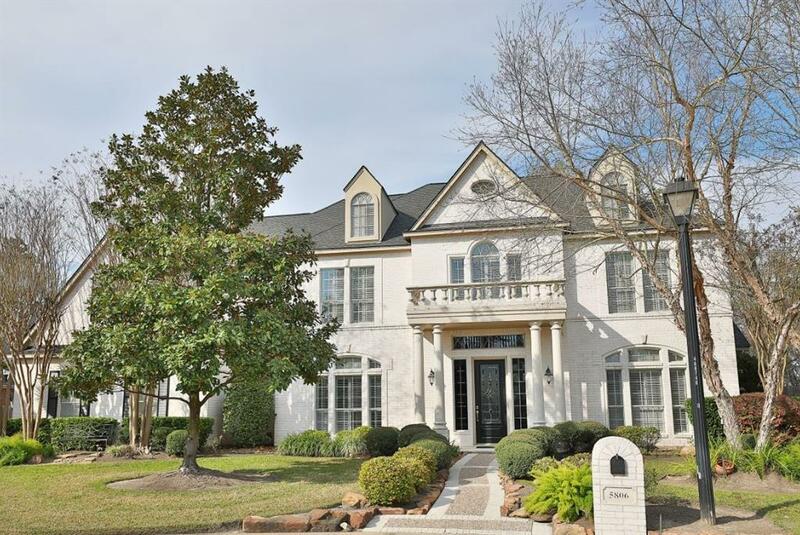 Stately 5 Bedroom Custom home features a grand two-story entrance w/ hand-scraped hardwood floors, soaring spiral wood stairs & a breathtaking view of the back yard through the wall of windows in the 2-story living rm. This stunning home exemplifies quality & attention to detail in every room. Fabulous living areas include: formal living & dining room; family room w/ gas log FP; plus lg game rm w/ built in cabinets on the 2nd flr. Lavish outdoor living features a lg lot w/ pool/spa/rock waterfall; lg covered patio w/ ceiling fan accessed from kitchen & master bedroom. The amazing chefs kitchen top of the line appliances: SubZero refrigerator, Viking 6-burner gas stove, Stainless KitchenAid dbl convection oven, warming drawer & KitchenAid SS dishwasher. The handsome office features custom built in desk & cabinetry inside double French Doors. There are 4 lg bedrooms upstairs (one could be a second master or media room) w/ 2 bathrms on the 2nd flr, all w/ new carpet. NEVER FLOODED!